With key patents preventing competition in the 3D printing market expiring in February 2014, it’s no surprise the technology is now having a major effect on the retail industry as we know it. Last Monday, the ecommerce innovation giant, Amazon, introduced a new shop on its site dedicated entirely to 3D-Printed products. 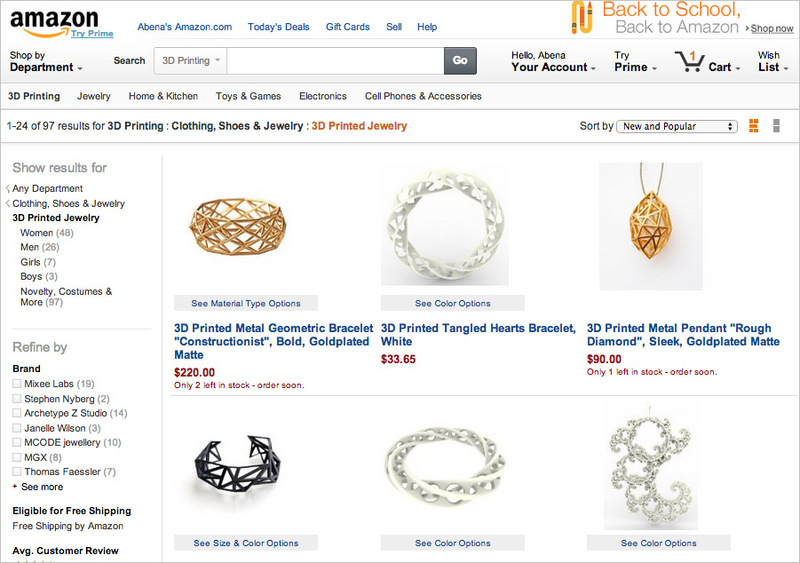 In addition to browsing books, movies, music, and other items Amazon is traditionally known for, online shoppers will now be able to select from over 200 3D printed products, many of which are customizable. “The introduction of our 3D Printed Products store suggests the beginnings of a shift in online retail – that manufacturing can be more nimble to provide an immersive customer experience,” said Petra Schindler-Carter, director for Amazon’s marketplace sales, in a statement. Amazon’s embrace of 3D technology not only creates a viable marketplace for start ups and small businesses in that space, it suggests there is a real demand for personalized products among online consumers. With wearable items like 3D printed jewelry and accessories among Amazon’s product listings, it’s only a matter of time before 3D-printed apparel goes mainstream as well.